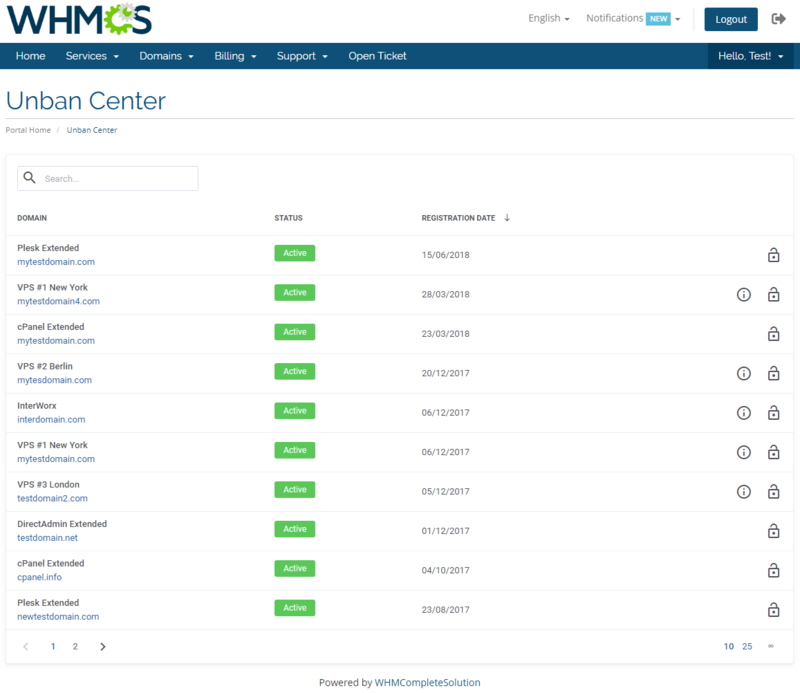 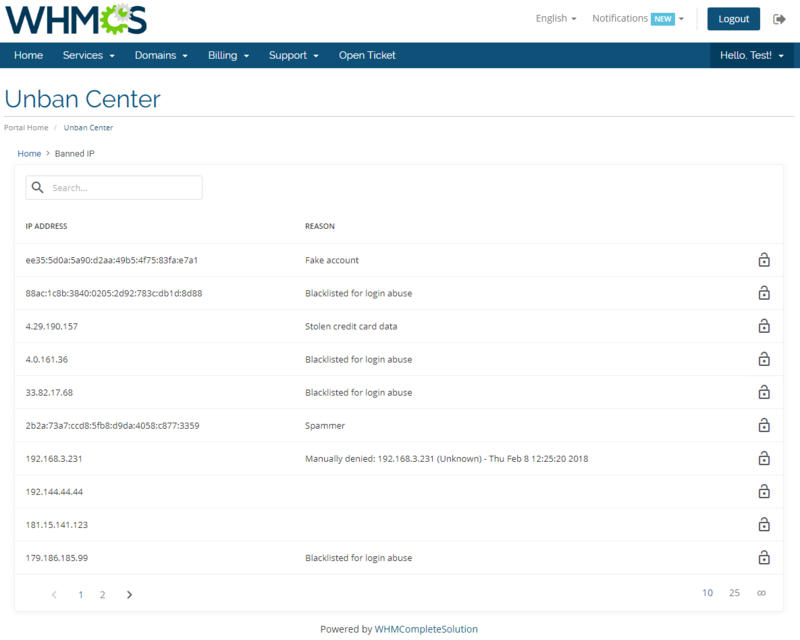 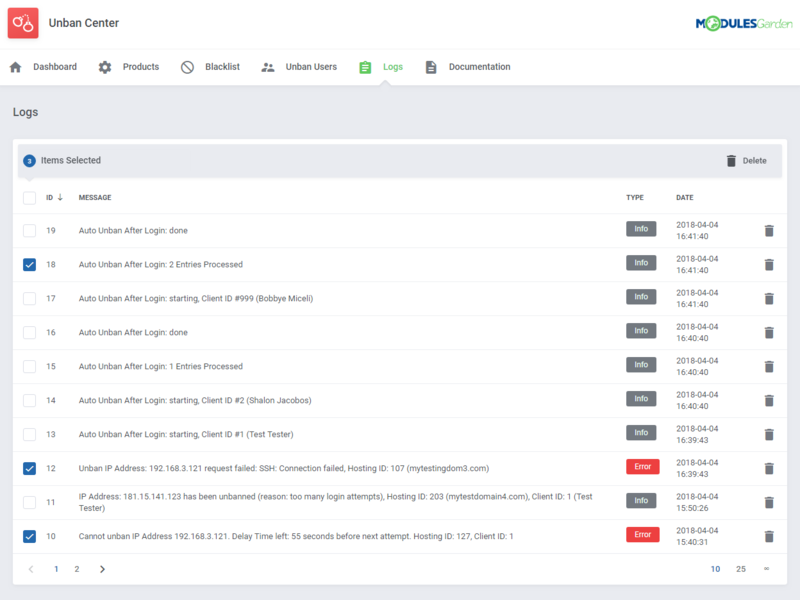 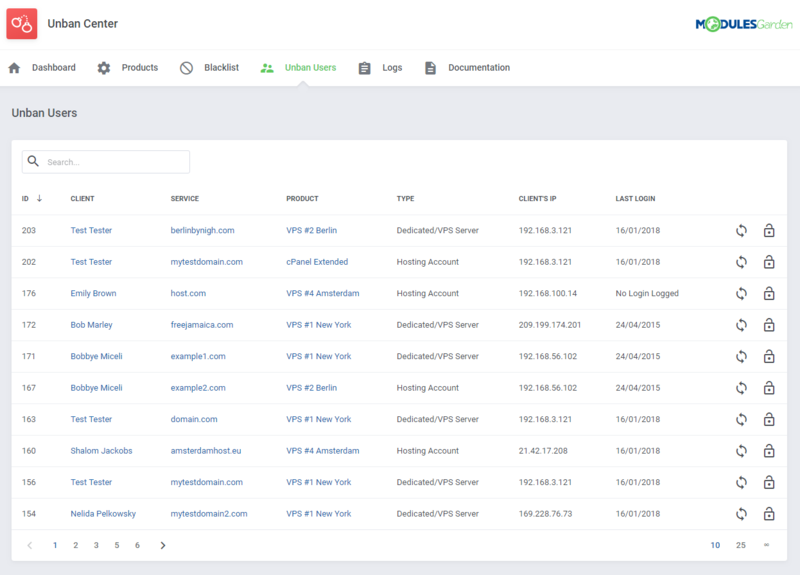 Unban Center For WHMCS has been designed to let your clients remotely unlock banned IP addresses in the most distinguished control panels, and also in VPS servers they are hosted on. 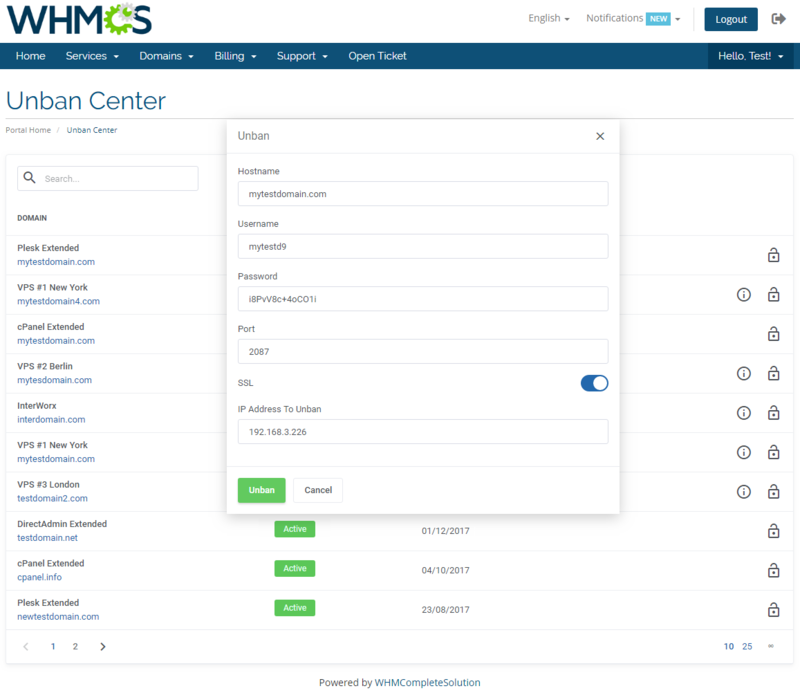 The module is fully integrated with cPanel, Plesk, DirectAdmin and InterWorx, but you are free to create alternative submodules for other systems, and thereby suit all features masterly to the exacting standards of your business. 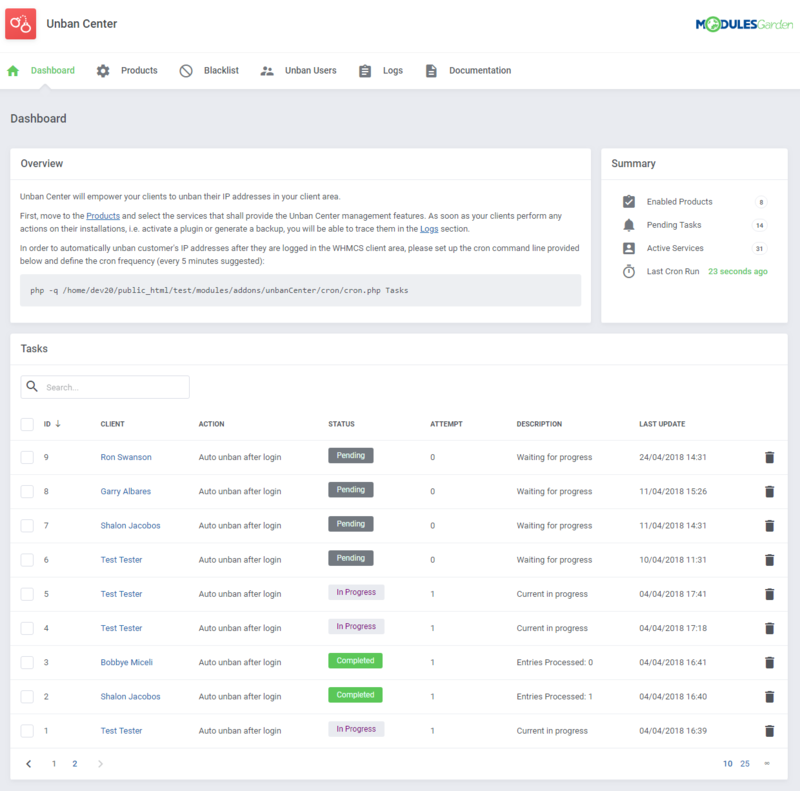 This tool boasts extreme ease of use, as it loads all the products in an instant based on the supported servers and submodules - the only step you need to take is select the ones that shall be enabled, and pick the preferred unban type. 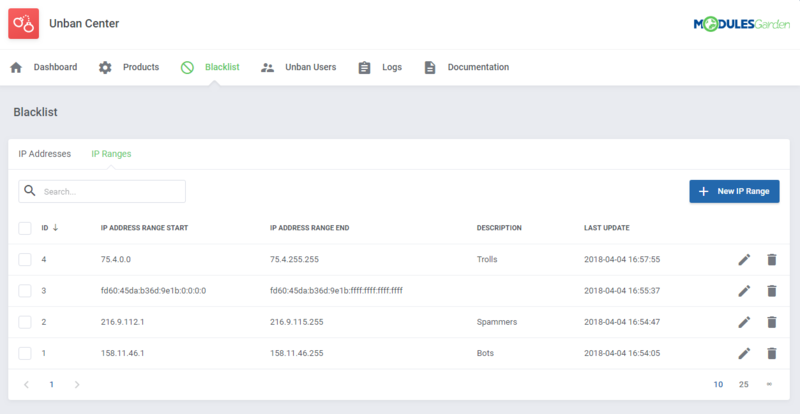 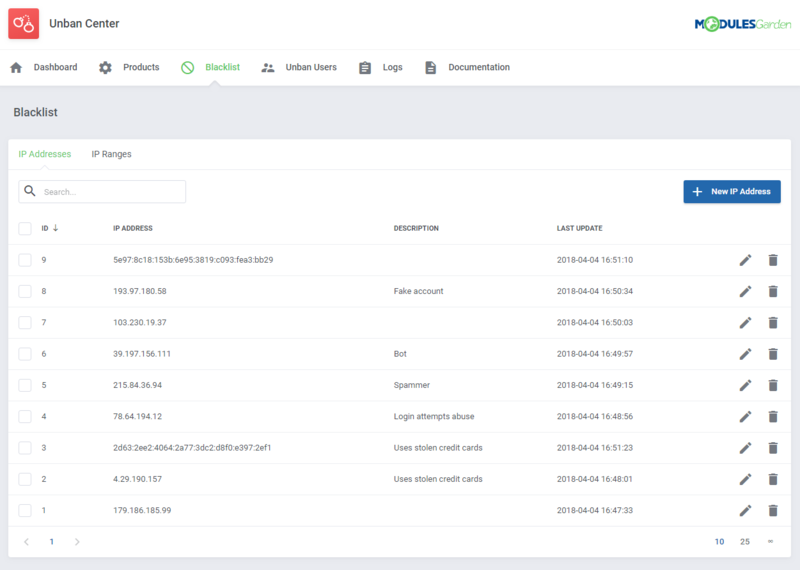 Additionally, you will be able to compile blacklists with particular IP addresses or even their complete ranges that cannot be unlocked, as well as unban clients automatically after they log in to your WHMCS. 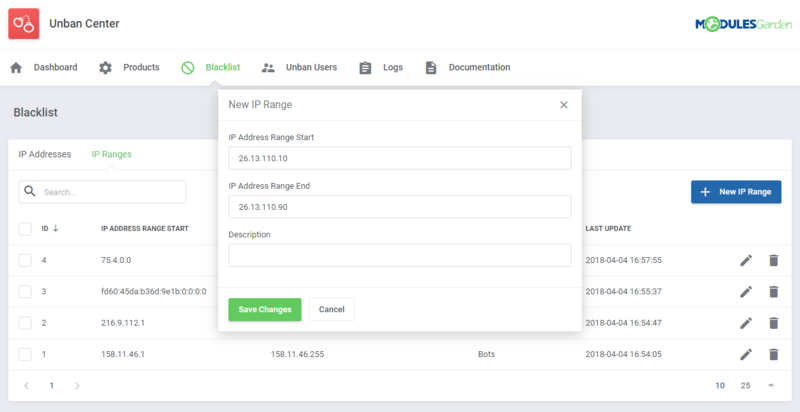 If you choose to let them, your customers will be also allowed to view the reason behind the ban and unlock all IP addresses located on their VPS or a dedicated server. 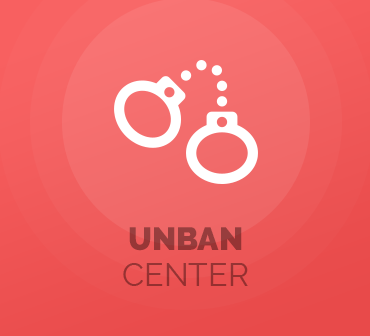 Whether you wish to let your clientele quickly and capably unban their IP addresses directly on your website, or rather want to handle it all on your own - make the only right choice and order Unban Center For WHMCS! 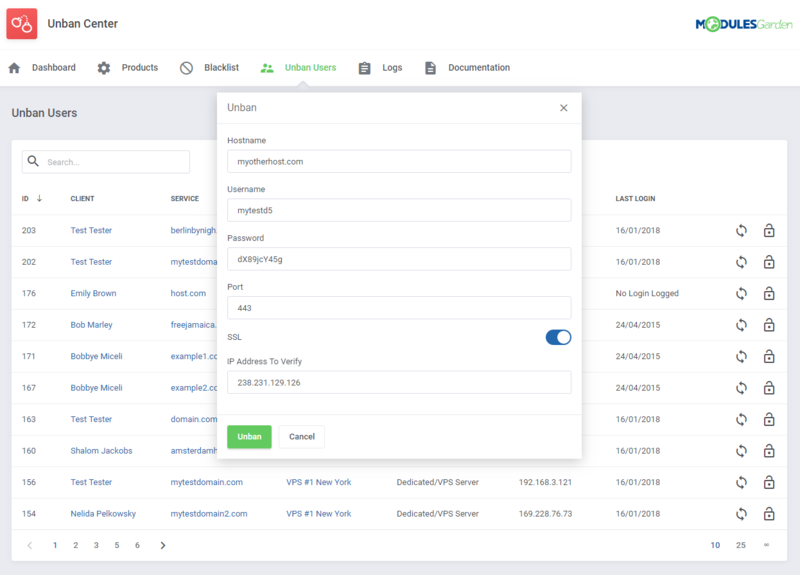 We love this product as it allows our clients to easily remove their blocked IP addresses from cPanel without having to log support requests with our help desk. 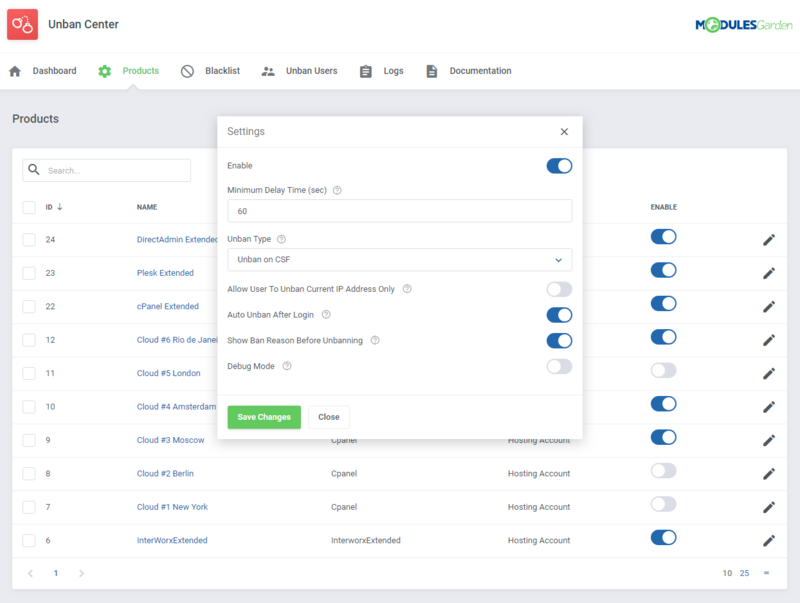 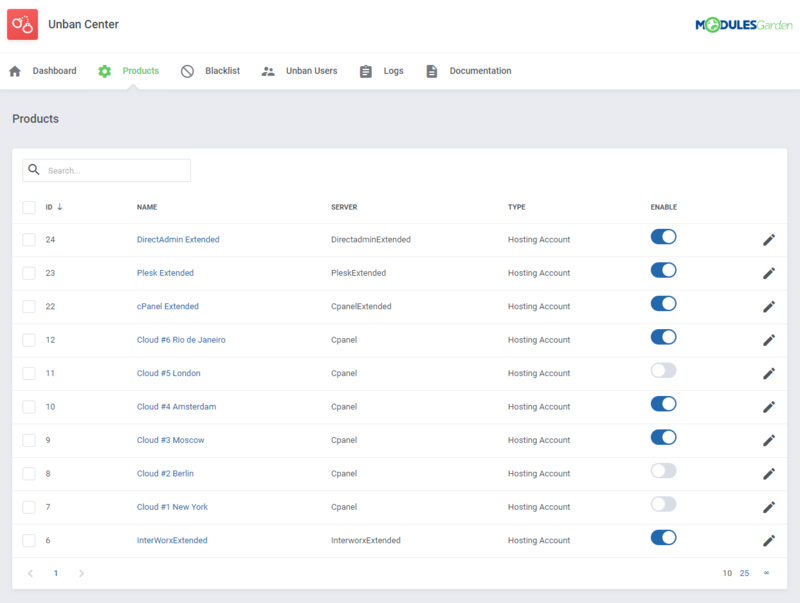 Automate the mechanism of web hosting accounts provisioning, supervise offered products remotely and insert tools for their close management into your client area.